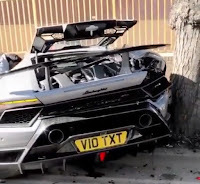 Tuesday, March 26, 2019 - This guy tried to show off his brand new Lamborghini Huracan worth Sh28 million in public but it didn’t go according to plan. The pricey, high performance sports car was written off after the driver tried to pull a stunt on the road. Footage shows the driver revving the car's 5.2-litre V10 engine, before setting off down the road. But seconds into the ride, the driver seems to lose control and slammed into the wall before coming to a stop against a tree.